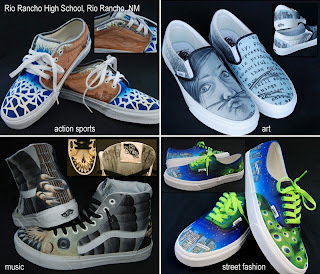 Rio Rancho Art Association: VOTE FOR THESE VANS SHOES! Imagine kids all over the world wearing these Van shoes designed by our students here at Rio Rancho High. I can see kids wearing them while skate boarding, going to the movies, hanging out, going to school, etc. Rio Rancho High School art teacher, Matthew Lutz worked with his students to participate and submit these designs to the Vans Sneaker Company. For the past month, 19 of his students custom painted four pairs of Vans shoes for a national design contest. Up to ten schools per state participated. Today, they found out that they made the Top 20. Now, the public will choose four winners from those. Starting Friday, April 16, go to http://vans.com/customculture/vote.html to cast your vote for Rio Rancho High School in the southwest region. If they are the most popular school in the region, their team gets to fly to LA for a five day trip. 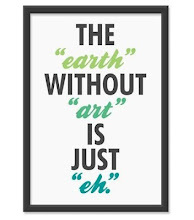 If they are selected as the winner from the Final Four, their art department will win $10,000. Please vote for them this Friday-Sunday, April 16-18. Go to http://vans.com/customculture/vote.html and choose Rio Rancho High School. You can vote once from each computer. I would like to add some information about vans shoes. Vans started to create shoes for a number of sports from skateboarding, wake boarding, motor cross, to surfing in an effort to compete with large athletic shoe companies. Bottom right is my favourite!